This page will walk through Spring Boot REST + Angular + JPA + Hibernate + MySQL CRUD example. We will create a REST web service application using Spring Boot and a client application using Angular. REST web service will expose methods for create, read, update and delete operation. The Angular application will use Angular Http API for CRUD operation. If our client application is running on different domain from web service domain, then the Spring Boot web service controller will configure client domain URL using @CrossOrigin annotation to handle Cross-Origin-Resource-Sharing (CORS). 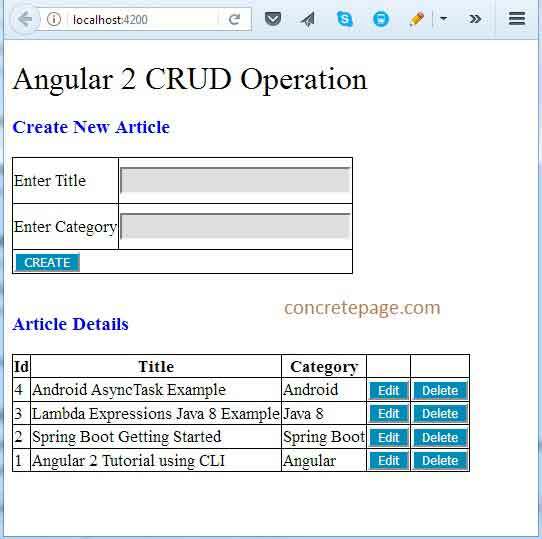 Angular application will be single page application that will perform CRUD operation. On the basis of REST web service response HTTP status code, the Angular application will display messages for success and failure of CRUD operation. In our REST web service application we will expose two methods for read operation, one for fetching data by id and another for fetching all data. In our example we will perform CRUD operation on article. When we create article, the article id will be automatically generated by database. To fetch and delete article by id, we will use request parameter to pass article id from client to REST web service application. In our Spring Boot application, we will configure database using application.properties file. To interact with database we will use JPA EntityManager. Now find the complete client and REST web service application step by step. We will use following HTTP URLs, methods and response status code for CRUD operation in our example. 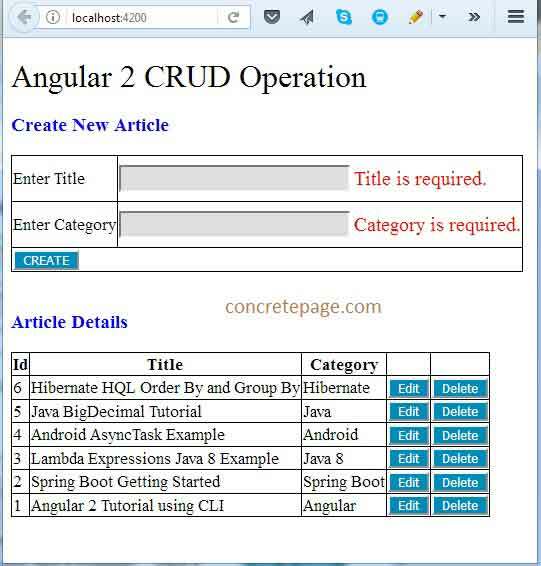 The output of our Angular application for CRUD operation will be as follows. Find the client code to create the article. Here we will use Angular Http.post() method. We are passing header Content-Type as application/json. After successful operation we are returning status code as an instance of Observable. Find the web service method for create operation. The above code will fetch an article for the given id. Now find the client code using angular that will fetch all articles from the server. Find the web service method that will accept request parameter to filter the result. @GetMapping is the request mapping for the HTTP GET method. It accepts the article id as request parameter that is used to fetch article by id. On successful operation it will return the article for the given id and HTTP status code 200 OK.
Now find the web service method that will return all articles. On successful operation it will return all articles and HTTP status code 200 OK.
We will perform update operation using Angular Http.put() method. It hits the URL using HTTP PUT method. Find its syntax. body: This is of any type object that will be passed to REST web service server. In our example we will create an Angular class as Article and pass its instance to body parameter. The instance of Article will have article id on the basis of which other fields of article will be updated. In our Angular application we have created a class as Article and we are passing its instance to Http.put() method. The article will be updated on the basis of article id which is a field of our Angular Article class. Find the web service method to update the article. In the above code Article is a java entity that is equivalent to Angular Article class. @PutMapping is the request mapping with HTTP PUT method. On successful operation, the HTTP status 200 OK is returned. Find the client code using Http.delete() method to delete article by id. In the request parameter we are passing article id to delete the article. Find the web service method that will delete the article for the given article id as request parameter. On successful operation the HTTP status code 204 NO CONTENT is returned. We will create complete client application using Angular with TypeScript. For development environment we are using Angular CLI. Our client project will be a separate project from the REST web service project. Now let us discuss the complete client project. Find the technologies being used in our client application. Find the client project structure. We will create a service in which we will handle all HTTP operations to create, read, update and delete article. Angular provides Http class in @angular/http library that has methods get(), post(), put(), delete() etc. We will write create method using Http.post() method. To fetch the article we will create two methods using Http.get(), one for fetching article by id and another for fetching all articles. To update the article we will create update method using Http.put() and to delete the article we will create delete method using Http.delete(). Now find the service class. In our example we are creating Angular reactive form to submit the article that uses FormGroup and FormControl etc from @angular/forms library. We will create different methods to call service methods to handle CRUD operation for article. Now find the article component. Here we will create a complete REST web service application using Spring Boot with Maven. We will create a table in MySQL database and using JPA with Hibernate, our Spring Boot application will interact with database. While creating article we will not pass article id because article id will be automatically generated by database. In our web service controller we will expose methods for create, read, update and delete operation for the article. Find the technologies being used in our REST web service application. In our database we have created a table named as articles. Find the database schema. When we create article, the article id will be automatically generated by database. Now find the java entity for the above table. 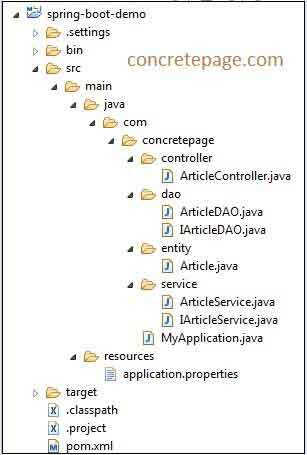 The properties related to datasource, JPA using Hibernate and logging will be configured in application.properties file. Find the DAO used in our example to perform CRUD operation. We will use JPA EntityManager to query database. Find the service used in our example for CRUD operation. Find the REST web service controller that will expose web service method for CRUD operation. @CrossOrigin annotation handles Cross-Origin-Resource-Sharing (CORS). This annotation can be used at class level as well as method level in RESTful Web service controller. In our example Angular project will run on following URL. And REST webs service project will run on following URL. We are using it at class level so that all the REST web service method will be available to our Angular application. Create a java class with main() method that will call SpringApplication.run() to run the application. We need to annotate above class with @SpringBootApplication that is equivalent to @Configuration, @EnableAutoConfiguration and @ComponentScan annotations. Find the steps to run REST web service application and angular application. To run the REST web service application, first create table in MySQL as given in the example. Now we can run REST web service in following ways. 1. Using Eclipse: Download the web service project source code using download link given on this page in download section. Import the project into eclipse. Using command prompt, go to the root folder of the project and run. and then refresh the project in eclipse. Run Main class MyApplication by clicking Run as -> Java Application. Embedded tomcat server will be started. 2. Using Maven Command: Download the web service project source code. Go to the root folder of the project using command prompt and run the command. Embedded tomcat server will be started. To run the angular application, find the following steps. 1. Install Angular CLI QUICKSTART using the link. 2. 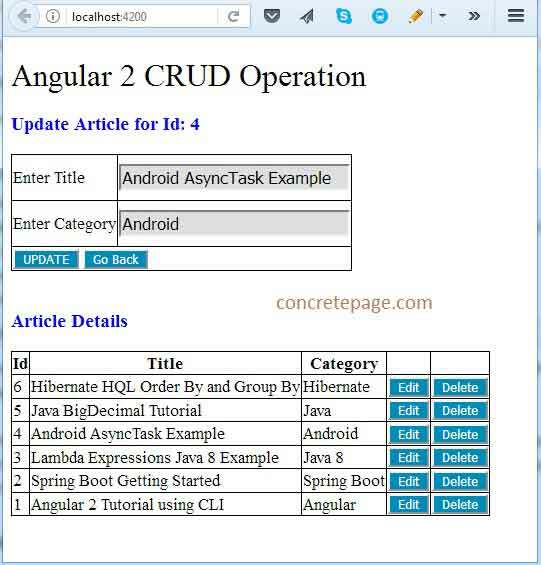 Download Angular project source code using download link given on this page in download section. 3. In your angular CLI application, replace src folder by the downloaded one. 4. Run ng serve command. 5. Our Angular application is ready on the following URL. a. Find the print screen when creating article. We will get validation messages when we click on CREATE button without entering data. Enter the data in the form fields and click on CREATE button to create the new article. b. When we click on EDIT button, we load article in form fields to update. Find the print screen. Click on UPDATE button to update the article for the given article id. By clicking on Go Back button we can return back to CREATE screen. Using DELETE button we can delete the article. I am done now. Happy Spring Boot learning with Angular 2+ !